Prefer to Purchase via the Telephone? Feel free to give us a call on 01202 232218 and we will be happy to take your order over the telephone (available Monday to Friday 9 am until 5 pm). Alternatively, email us, and we will be happy to give you a call back. Your Dogs Needs is part of Tricks 4 Treats (who run Pet Dog AND Agility Training classes in Poole, Dorset) and is run by husband and wife team, Jo (MAPDT 00953) and Paul Conibere (MAPDT 01039) who are both dog training instructors and members of the Association of Pet Dog Trainers (APDT). During the early stages of our training courses we were being asked about suitable training aids, the best foods to use as rewards in training and various other related questions. After researching such products and putting them to the test, we started to offer such products for sale within training classes. With the success of such a venture we felt it was time to expand our range and pass on such knowledge to a wider audience. As a result of this, Your Dogs Needs was born. 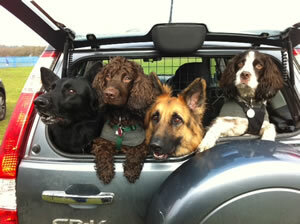 All products offered on Your Dogs Needs are recommended and sold to our training clients at Tricks 4 Treats. They have also been tried and tested by a vast array of dogs’, including our own German Shepherds, Bo and Roo, and those that belong to our training colleagues, these being Labradors, a variety of Spaniels and Terriers. We pride ourselves, both at Your Dogs Needs and Tricks 4 Treats on the fact that we do not, through choice, offer anything aversive, coercive or punitive as a way to ‘train’ any dog. With our knowledge, understanding and experience, we are aware of the very many different and kind ways to help guide our dogs’ in the very best way that we can. Alongside our own thoughts and feelings, we work with the Association of Pet Dog Trainers ethos, this being ‘Kind, Fair and Effective’. The APDT (Association of Pet Dog Trainers) is a voluntary organisation established to improve the welfare of dogs and the competence of dog owners through the promotion of training skills and techniques based on up to date, researched, methods that apply the principles of kindness, fairness and effectiveness and are in keeping with modern learning theory. Members are responsible for continuing their personal and professional development by undertaking further training and study and acquiring knowledge of new theory and practice. The training methods employed and advised by members shall be consistent with the principles of kindness and fairness to both clients and dogs. The training techniques employed and advised by members are assumed to be the application of scientifically-based research and knowledge and to result from practical experience of the use of non-compulsive methods. As part of Tricks 4 Treats, we also belong to the 'Buy with Confidence' scheme. Abide by the terms of membership of the scheme. 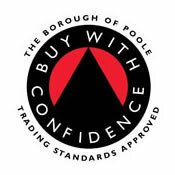 For more information about the scheme, please see the Buying With Confidence web site.